The Sons of Scotland Pipe Band, Canada's oldest civilian pipe band established in 1896, is now pleased to announce their Honorary Members program. People from all walks of life and from all backgrounds will be honored as members of the band in some way; though their support at events, with financial contributions to help the band, or in other ways. To nominate someone for an honorary membership, please email the band at sospb@sospb.com anytime. supporting awareness of this very important cause. It turns out that Ms.
Campbell used to play the pipes, and took lessons with the Sons of Scotland! Truly a great coincidence. Visit her site at www.alungstory.ca for more information on her. Welcome to the Sons, Helene! Fans of the band come from all places and support many aspects of the Scottish community. Rick and Sherry are truly Black Watch supporters, and enjoy coming along to many pipe band events both in Ottawa and Montreal. 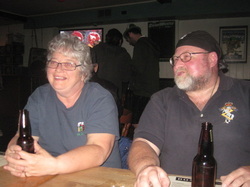 As supporters of the Sons of Scotland, Rick and Sherry help out at shows and cheer us on - the Black Bear's traditional yell has never sounded so good! Their lovely words were a pivotal part of the video sent to Her Majesty The Queen in honor of the band's Diamond Jubilee show '60' held June 2, 2012, in Ottawa. We are honored that they are part of the extended Sons family and thank them for their kind support! Author, Bon Vivant and friend to the band Iain Banks is one of Scotland's best authors. Voted one of 50 Greatest British Writers since 1945 by the Times newspaper in 2008, Iain has written many books that appeal to folk from all over the world. His book 'Raw Spirit - In Search of the Perfect Dram' prompted Pipe Major Bethany Bisaillion to email Iain to compliment his fine work and wicked sense of humor, and they've been friends since. 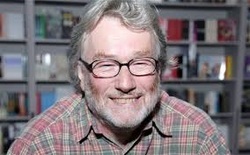 Visit his site at www.iain-banks.net to learn more about this great, talented man. 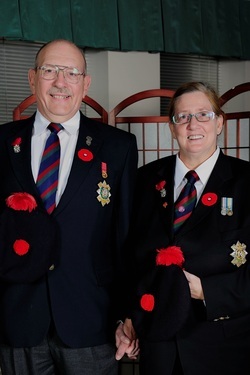 Michael, retired Pipe Major of the Special Service Force Pipes and Drums and current Pipe Major of the Kemptville Legion Pipe Band and his wife Beth Durant (bass drummer) are supporters of the Sons of Scotland. As a teenager in the late 60’s early 70’s Michael played with the Sons of Scotland under Pipe Major Allan Quinn. They are both honoured to be chosen as Honourary members of the Sons of Scotland Pipe Band. One of the world's funniest comics and best comedian pipers, Johnny 'Bagpipes' Johnston met the band in 2001 when he was casting for his documentary 'They Pipe Among Us' which featured pipers from all across Canada who had interesting day jobs but piping in common. He invited Pipe Major Bethany Bisaillion to be the band's Pipe Major for the project, and they featured the pipe band in the film too. He has visited Ottawa to provide support to the band on many occasions, and is truly regarded as one of the band's favorite guest players! Helping build schools in Africa and provide much needed education to kids there is one of John's passions too. Visit www.johnnybagpipes.com to read more on this philanthropic, kind friend of the band.